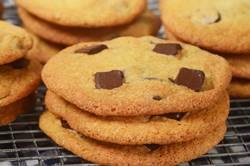 The Chocolate Chip Cookie is America's most famous cookie. It was invented in 1930 by Ruth Wakefield, who was the owner of the Toll House Inn in Massachusetts. The story goes that one day she decided to add small chunks of a Nestle's Semisweet Yellow Label Chocolate bar to her cookie dough. The 'chocolate chip' cookies were an instant hit with her customers. Word must have spread of how good these cookies were, because by 1939 Nestle was selling small chocolate morsels (or chips) in a yellow bag. Nestle went on to buy the rights to the Toll House name and to Ruth Wakefield's 'chocolate chip' cookie recipe. They called her recipe "The Famous Toll House Cookie" and printed it on the back of their Yellow bag of chocolate chips. This Chocolate Chip Cookie recipe is very similar to the recipe that is on the back of the bag of Nestle's Chocolate Chips. The batter is made with unsalted butter and a combination of white and brown sugars. It produces a rich and chewy cookie with beautifully crisp edges. For the chocolate chips, you can use semi sweet, bittersweet, milk, or even white chocolate chips. Or you could use a combination. While I prefer my chocolate chip cookies without nuts, you can fold in one cup (100 grams) of chopped walnuts, pecans, or hazelnuts. This recipe produces about 32 - 3 inch (7.5 cm) cookies. The batter can be stored in the refrigerator for a couple of days if you don't want to bake all the cookies at once. You can also freeze this dough. To do this, form the dough into round balls, flatten them slightly, and place on a parchment lined baking sheet. Freeze and then place the balls of dough in a plastic freezer bag, seal, and freeze. When baking, simply place the frozen balls of dough on a baking sheet and bake as directed. You may have to increase the baking time by a few minutes.